Campbeltown, Kintyre Peninsula, Argyll, Scotland. View these at Find A Grave page. Please be patient, this is a large file and will take some time before it shows. 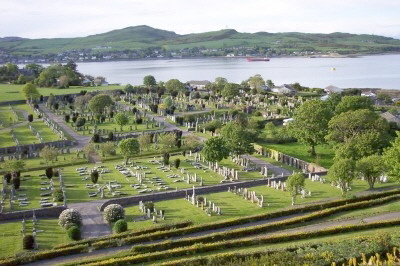 Go to the SURNAME SEARCH page to search for graves in all the Kintyre cemeteries. An alphabetical list of photographs sorted by the name appearing on the memorial stone. Click to see how to get a copy of tombstone image. Look through the entire list since punctuation will cause some to be out of alphabetical order. Please note that the Find A Grave page for this Cemetery has images added for all the memorial stones. If you would like to have a copy of one of the images, send an email to Muriel Adam. She is doing this as a complimentary service and asks that your request be limited to six images. These images will be provided for personal interest and use only. They are not to be used for financial or commercial gain. Click on the envelope to send an email image request to Muriel, this should open a message, in your mail client, addressed to her. Because I like to hear from people who use this web page of mine, I would like to have you send me an email telling me what your geographic location is and any other information you care to pass on. © 2009-2017 Harold A. Ralston, Mt Pleasant, Wisconsin, USA.